Duane Burkhart is set to retire at the end of the school year after 35 years at Tippecanoe Valley High School. Burkhart has served as the school’s athletic director for the last 24 years. 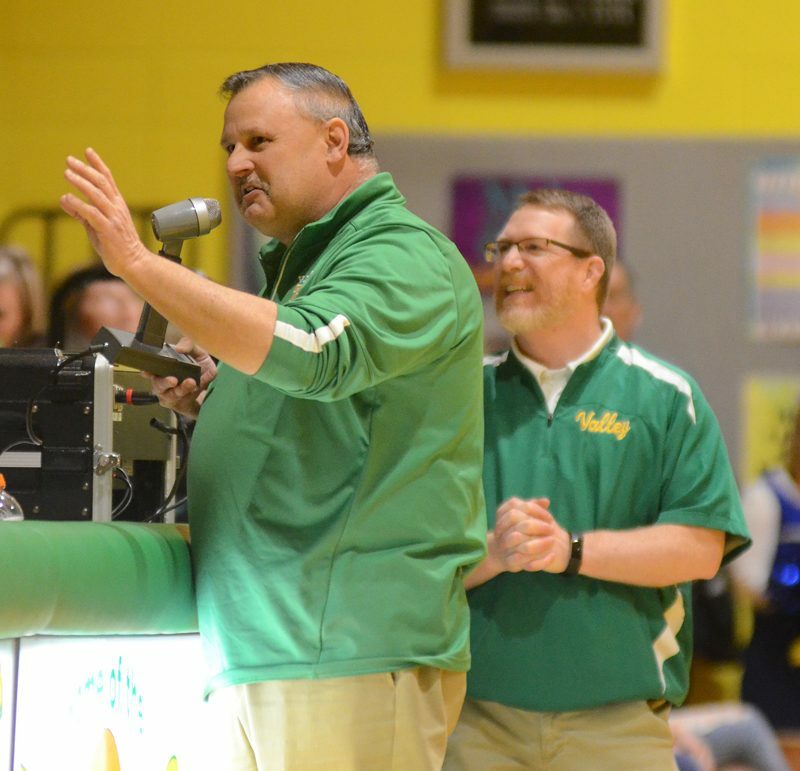 AKRON – Duane Burkhart has many fond memories of his 35 years at Tippecanoe Valley High School. One of the best, and also funniest, involves arguably the most-beloved man ever connected to the school. Scott Bibler. the former football coach and longtime guidance counselor at TVHS, was a friend to anyone who met him. “We were playing a football game down at Southwood and Bibs got tossed in the first half,” recounted Burkhart. “I was keeping stats at the time for the team and I was talking to the side judge trying to get an explanation and figure out the penalty yards. For the record, Valley won that game by a 28-7 final in 2000 as then assistant coach Jeff Shriver took over the team for the remainder of the game. Burkhart, who is set to retire at the end of the school year, counted Bibler as one of his nearest and dearest friends. Bibler, along with former Valley football coach and Warsaw city councilman Charlie Smith, his son Scott, and former sprint car driver Tony Elliott were tragically killed in a plane crash in South Carolina as they flew to attend the Notre Dame at Clemson football game in October of 2015. 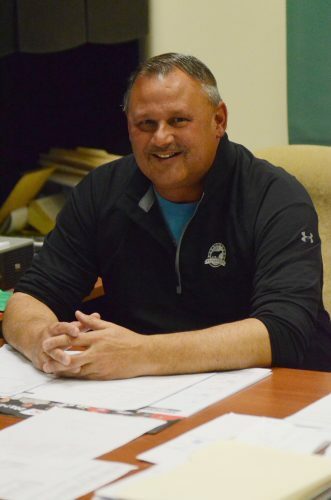 Burkhart, who has spent the last 24 years as the Valley Athletic Director, has no trouble pinpointing the toughest day in his long career at Valley. The press box at the Valley football field is now named the Scott Bibler Memorial Press Box in honor of Bibler, who was also nicknamed the “Mayor of Mentone”. The press box, which was completed prior to the 2016 season, was donated by the Bibler family, his wife Stephanie and daughters Chelsea and Megan. The field where the Vikings play is now named Smith-Bibler Memorial Field-Home of Death Valley Football, in honor of Bibler and Charlie Smith, the man who coached the Vikings to a state championship in 1979. Burkhart, who is just the second AD in school history, says that he has thoroughly enjoyed his long tenure as a coach, teacher and AD at Valley. “I’ve been very blessed to do what I love for the last 35 years,” said Burkhart, who came to Valley in 1982. “I just want to thank our School Board and our community here for that privilege. Burkhart, who is 57, admits though that he is ready to step away. “I’ve always had a goal to retire early and I’m blessed to be able to see that occur,” Burkhart explained. “I want to step back and enjoy life with my wife (Angie) while we are in good health. Burkhart says that he plans to spend more time with his family first and foremost now. He also plans to be on the golf course even more now and do some traveling, especially to a warmer climate during the cold Indiana winters, which he is no fan of. Burkhart, who was 113-42 as the Valley girls basketball coach from 1987-95, says his focus has always been on a team approach when it comes to running a high school athletic department. “It’s not been about me, but about we,” emphasized Burkhart, who has also been the head baseball coach, track coach and a football assistant during his time at Valley. “I’ve been blessed that we have had so many coaches and other people who help with our athletics (such as scorekeepers, announcers, etc.) who have been here at Valley for years. Burkhart, who also teaches psychology and sociology, has overseen an athletic program with its share of ups and downs in a challenging time. The Vikings won 43 Three Rivers Conference titles and 17 sectional championships since 1995 when Burkhart became the AD. The highlight came in 2015 when the girls basketball team was Class 3-A state runner-up. “I feel good about what we have done here at Valley,” said Burkhart of his tenure as AD. “I do feel that we are very competitive. Everyone wants to win, but that’s not what high school athletics is all about. And a credit to the man who will be greatly missed after 35 years of countless contributions to Valley athletics and its student-athletes at so many levels. You have definitely earned it.